This Trophy Shelf is made from unfinished pine. The overall dimensions are 38"x24"x5.5". It was sized to hold soccer and baseball trophies for my nephews. I really like this shelf, and you'll find a variant of it in my house, smaller, sized to hold DVD's, but used instead for keepsakes and trinkets from vacations and stuff. You can stagger them or mount them on the wall diagonally for cool effect. 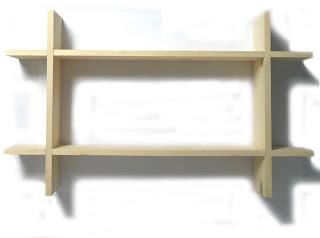 The shelf shown is made from pine, and is priced at $40.00 unfinished. Finishes or other woods are available of course. Other sizes too - the possibilities are limitless. Made from Pine, this Built-Up Custom Crown Molding Wall Shelf was built per a customer's designs. Via email and phone we exchanged pictures and sketches for a week as she showed me her crown moldings and explained what she wanted and I showed variations in design until we reached the perfect shape for her. She paid her deposit and I went to work, and a week later it was ready to ship. This, I think, is where I stand out from other places you can get shelves or home decor - I build to suit, to match what you have, instead of having to settle for something that isn't quite right. This shelf is 26" long and 9" wide, made from 17 separately cut and sanded pices of pine - the shape was particular enough that moldings at the lumber store just didn't cut it and so I made my own. The the unfinished price is $80 not including shipping. A step up from a Framed Magnet Board, the Magnetic Chalkboard - Custom Sized can do all the magnet board can and then some - write messages, keep track of the kids' chore chart, draw pictures, stick up photos and artwork - unclutter your fridge and do it with style. The Magnetic Chalkboard shown is from knotty pine, unfinished, with a 12"x12" magnetic chalkboard surface. This would cost $32.28 as shown. Why settle for standard sizes or someone else's style? Any size is good for me, and other woods are available. I can make a Magnetic Chalk Board part of another project like a calendar holder; I can add a tray below for holding magnets or chalk, etc. Finishing is also an option. Unlike unfinished pine stuff from the craft store, my products come puttied and sanded and ready to finish. If you're looking for more traditional picture frames, try my custom frames. This frame was made to order - this is what 'By Design' is all about. A customer called needing a custom frame size, for a school fundraiser, at an affordable cost. They want to do tile mosaics on the frames by the kids. We came up with the idea together of a hardwood lip around the edges so that the tile and grout is all contained. We worked together on the size and detailing to find a price that fit her budget and still made it possible for me to do the job. Then I went to work. A week later the frames were done and ready to ship, in time for the kids to decorate and make the fundraiser schedule. It's cherry around the edges, birch plywood for the backing. 10"x10", puttied and lightly sanded and ready to ship to the school for the kids to get busy. These came to $10 each because she ordered 25, and that's exactly the yeild I get from one 4x4 piece of birch plywood and one 10'x6" piece of cherry. If you want less the price per frame will have to go up. Thank you Kade, room mother for the Immaculate Conception Catholic School in Fort Smith, Arkansas! I hope you like your frames and that your fundraiser goes well! OK, so the Above-Garage Storage Platform isn't exactly home decor, but if it gets the clutter out of your home and frees you up to decorate a room, does that count? If you're like me, room for storage in your house gets a little tight. But how's your garage? Mine has 12' high ceilings. The garage door has all this empty space above it that, until now, was not being put to any use. Well, those days are no more. I did structural calculations, which as an engineer I can stamp and sign myself, ordered the materials, and built this platform. It can hold pretty much anything you'd put in your plastic buckets, and has about 30" of headroom. I've now got about 340 square feet of storage I didn't have before. If you have 3-4 feet above your garage door, in a double car garage, I can build one for you. This may seem branching out a bit from my usual stuff, but as far as I'm concerned, this is a shelf. A big one, but a shelf none the less. Want one? One this size I will build for you on site for about $1,500, depending on how far you live from my home and the size and shape of your garage. When I finished this one, I let the kids up with me for a few minutes. Then it was time to get them washed up and ready for bed. After his bath, my 4-year old son asked me, "Dad, um, can we go up in the...uh...the place that is so totally cool?" I like that much better than 'storage platform' or 'mezzanine.' I love being a dad! Framed Magnet Boards have become a popular way to unclutter your fridge and attractively display just your favorite photos and school projects. The magnet board shown is from knotty pine, unfinished, with a 12"x12" magnetic surface. This would cost $23.64 as shown. Why settle for standard sizes or someone else's style? Any size is good for me, and other woods are available. I can make a magnet board part of another project like a calendar holder; I can add a tray below for holding magnets or pens, etc. Finishing is also an option. Unlike unfinished pine stuff from the craft store, my products come puttied and sanded and ready to finish. The Five Board Bench has long been a staple in home furnishings. Five board benches come in many sizes and shapes. From footstools to benches like this, anywhere in between. This one is solid pine, and simple square construction, 4' long, 18" high, and 12" wide, give or take. Great for the entry way. I can add armrests, backs, make it more decorative with corbels or routed edges, make it out of oak, walnut, maple, cherry, or any other wood commercially available. Pine is the least expensive solid natural wood option, but anything that is available is fine with me. this is the bench priced in my blog at $57.50 unfinished. Shoes not included. These Custom Coat, Robe, or Towell Racks have been a very popular item for people to buy. $7.50 per peg unfinished, $12.50 per peg finished with paint, and you've got a great way to tie together your kids' bedroom furniture and wall paper or decorating theme. I've done flowers, butterflies, cars, honey pots, dinosaurs, stars, on stained or painted backdrops. All is 3/4" thick solid pine with hardwood shaker pegs. Back of rack has keyhole mounts at 16" centers for stable mounting into wall studs. Take a photo of your wallpaper or border, tell me what colors you want and how many pegs. Size is typically 7-1/2" high by 10" per peg. This Custom Clock was made to go with the crown molding shelf in my newly remodeled bathroom. Made from pine, edging and paint to match the moldings we used, and raised number clock parts. My boys actually did a lot of the work so they could give it to their mom for Christmas. It's just one example of the limitless possibilities out there. It's hard to find a picture that does picture frames justice. But then, I guess that's because the frames are there to do the pictures justice - ha ha. Lots of friends have asked for frames for their walls - they want to match their decor, fit a funny picture, etc. without having to go through the expense of a framing service at a craft store or something. Mostly I've made these Custom Picture Frames out of pine, with a rectangle cross section, but that's not all I can do. Other frame-type projects I've done include magnet boards, magnetic chalk boards, shadow boxes, etc. Typically glass and backing is not included. Most photographers recommend a protective coating instead of glass anyway. Unless it's a custom size, you can just buy a frame at the dollar store and use the glass and backing from that. Ask my wife sometime if you want the full story on our picture wall. Let's just say it involved cutting of my fingernail in the tablesaw, putting off her frames to make some for clients, refiguring what we wanted the frames to look like, etc etc etc. Years in coming before she finally got her frames. I'm sorry to say my clients get much better service. Price: see list on my home page for standard sizes. Custom Picture Frames of the style shown are $0.25 per inch of perimeter of frame for other sizez. For example, a frame for a 10x10 picture, with 2.5" wide sides, would have a perimeter of 60 inches (10+2.5+2.5)x4 and would cost $15. You may have seen a Crown Molding Wall Shelf in stores or catalogs, but have you seen one that exactly matches the moldings in your home? I can make one for you. We recently remodeled our bathroom - we added beadboard, new moldings, and crown moldings, and painted the walls a deep red color. Then to perfect things, I made two shelves like this from crown molding matching that around the ceiling. In another room, I would have left them natural and stained them, but the white matched the decor. This Crown Molding Wall Shelf is about 2 ft long. I would charge about $20 per foot on one like this, give or take, depending on the materials and finish you choose. If you want something more complex, I can do that too. This Faux Drawer Wall Shelf is really the first of my projects I ever sold. My wife took me in to quilted bear and showed me a shelf like this, only longer, and said that it was what she wanted on her wall. Only it was $100. So I convinced her to let me have a go at building the same thing myself. It turned out so well that she had to show all her friends. I have lost track of how many of these I've made. I've sold them at craft fairs, to friends, given them to family and friends as gifts, and we have two of them hanging in my house. I can stain it, paint it and sand the edges (like the one shown) or whatever other sort of finish you want. Stained and varnished it adds a very formal feel to an entryway. Painted and sanded it gives a country-cottage type feel. Length can vary depending on where you put it. Mounting hardware is included and completely hidden. Faux Drawer Wall Shelf unfinished price: $20 per drawer panel. Shelf shown is 3' long by 12" high by 5.5" deep.